The New York Public Library held its annual Library Lions dinner last night, feting Jonathan Franzen, whose The Corrections is now being turned into an HBO TV series, starring Chris Cooper and Dianne Wiest, and featuring new story lines. 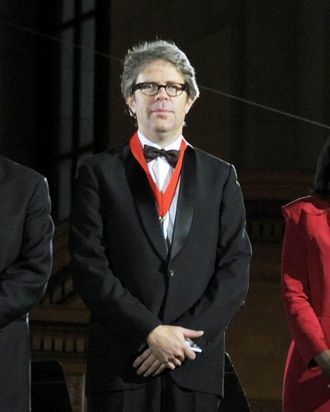 Franzen was happy to celebrate other authors, such as the ones he’s reading now: Ben Lerner and his perennial fave Edith Wharton. (Henry James is another matter.) Vulture chatted with the author about his reading habits, his television viewing preferences, and combining the two for HBO. I’m reading a lot of Edith Wharton, although that’s professional reading because I’m writing about Edith Wharton. I’m reading a beautiful, little novel called Leaving the Atocha Station, small press, by a poet, not like anything I can remember reading. What kind of a reader are you? Are you a fast reader? Do you read multiple books at a time? I dip into books to see if I like them. Often I’ll have to go through five or six before something starts working for me. I tried to start Portrait of a Lady last night, which I had read only in college … maybe it was too late to read anything, but I became so impatient with the multiple redundancies in the first paragraph that I cast it aside in anger! The first paragraph alone! You really have to be in the mood for Henry James. Have you made amends with the Kindle? I don’t have a reading device. If I did, I would have the Nook, but I don’t. I keep the books I like, and the ones I don’t, I get rid of. I used to sell them at the Strand, and now I just give them away. So at least they find new homes. The only books I throw away are foreign editions of my work. How many copies of the Finnish edition do you need to save? When you were originally talking about making this into a movie about ten years ago you had folks in mind for the kids. Names like Brad Pitt, Tim Robbins, Cate Blanchett, Naomi Watts were bandied around. Now they might be too old? I can’t speculate on the kids, but I will say that Chris Cooper and Dianne Wiest are great for the parents. We need somewhat younger actors for the kids for the show because there’s a lot of new material. A bunch of the show is new material, matching up with the parents at considerably younger ages, so they need to play a fairly large range of ages. Are you writing a lot of stuff that didn’t make the book but you had in your mind as backstory? It’s more like, I conveniently left out stuff that I couldn’t imagine, or had no reason to imagine it, and was surprised how much of that, when I do imagine that, actually fits. Minor characters in the book are becoming very substantial characters in the show, too. It’s fun. I’m coming back to the book as a stranger, essentially twelve years after I wrote it, and I’m filling in blanks that were deliberately blanks, but I’m having the pleasure of filling them in. Is it going to be linear in fashion, or will you tell any of it in flashback? We’ve decided that, but I shouldn’t talk about it. I think it’s going to be a different kind of pleasure than whatever shows are out there. That’s why I’m involved with the project. It’ll be like no TV I’ve ever seen. I love Breaking Bad. I have a thing for Friday Night Lights. Of course I like The Wire, like everyone else in my demographic. I like football on TV. I saw pretty much every episode of Law & Order for its first eleven seasons. I hear there’s a massive box set of all of Law & Order, which would be a perfectly mean Christmas present.